Tufted puffins are widespread in the North Pacific Ocean and nest on coastlines and offshore islands from southern California to Alaska and across the ocean from Japan to the shores of northeastern Asia. Conservation Status: Widely distributed species with very few population concerns. 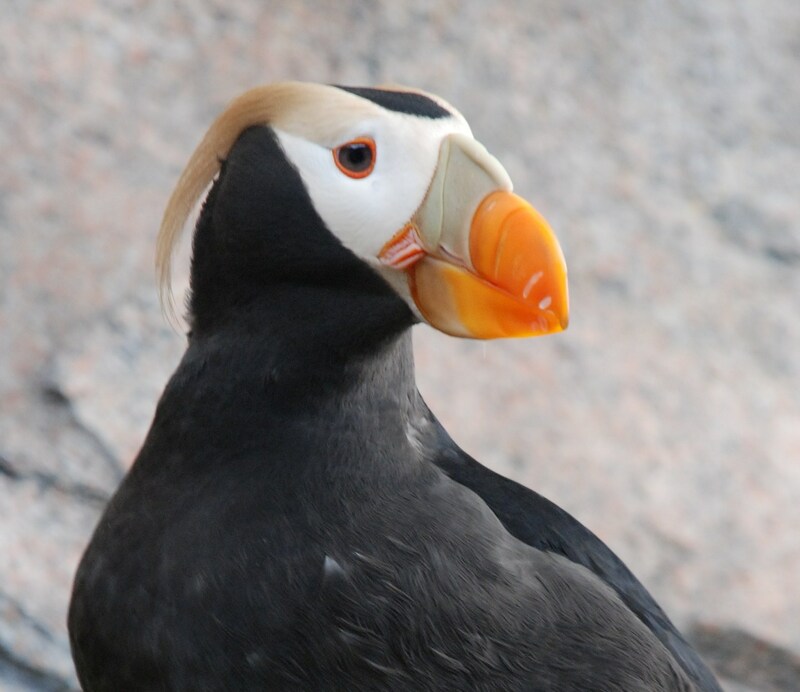 The tufted puffin has a distinctive breeding plumage in the summer, followed by a dark eclipse plumage in the winter. Starting in March, their breeding plumage of golden plumes behind the eyes and a bright white facemask grows in. The bill becomes a bright reddish orange and grows a beige bill covering, called a rhamphotheca, at the base. When breeding ends in the early summer, puffins lose their plumes and face mask, the bright colors of the bill turn to a dull reddish-brown, and their overall appearance is that of a simple dark black seabird. Although puffins spend a majority of the year on the ocean (pelagic), they build their nests on the shores of islands and coastal regions. They require shores with steep, grassy, sloping land with soil that allows them to dig burrows. Their burrows are typically two to six feet long, and four to six inches in diameter. When puffins molt they also lose their bill sheaths, called a rhamphotheca. Puffin bills have been used by Native Alaskans to adorn their tribal wear. Once pufflings leave the nest they do not return to land until 3-5 years later, when they have found a mate and are ready to breed. Older puffins can be distinguished by their white eye and 3 grooves in their beak.